Your car’s brakes are one of the most important components when it comes to safety. You want your brakes to work at top capacity at all times in order to avoid accidents. That’s why you should be aware of any of the warning signs of brake problems. Servicing your brakes is one of those routine maintenance chores that cannot be ignored, since brake parts need to be regularly serviced and sometimes even replaced in order to work properly. If you’ve noticed a red or yellow brake indicator lighting up in your dashboard, it could mean you’re in need of an inspection, and your car’s electric system is sending you a reminder. Any unusual noises coming from your vehicle may be a reason to stop and check what’s going on. However, if you’ve started hearing a high-pitched noise that stops when you apply the brakes it could be a sign your brake pads are wearing out. Also, a grinding sound that’s sometimes felt in the brake pedal could be a sign of gravel caught in the caliper unit or that it’s been too long since your last brake servicing, indicating your brake pads have worn out or a lack of lubrication in your rear drum brakes. Vibration when applying the brakes or shaking in the steering wheel can be indicators of an uneven brake rotor. The brake rotors are discs that sit inside the wheels, being hugged by brake pads in order to slow them down and also the car the moment you hit your brake pedal. For proper functioning, brake rotors should be smooth and completely even in their thickness. Other brake problems steering wheel vibrations could be warning you of damaged brake components such as the brake caliper not releasing properly or an improper wheel lug nut installation. If you’re noticing that brake fluid has leaked out when the car is parked, it’s time to take it for service as soon as possible. 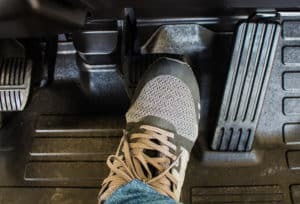 It’s not normal behavior for your car to pull to one side when you apply the brakes, they could be maladjusted or worn out and needing to be immediately replaced. This could also be a faulty brake caliper or wheel cylinder causing this issue. Overheated brakes or clutch could be the reason you’re smelling a sharp, chemical odor after repeated hard braking. If this happens, park in a safe place immediately, check your parking brake to make sure it’s released entirely and let the brakes cool down. Not doing this could heat up the brake fluid to boiling temperature which will cause immediate brake failure. Do not continue driving if you see smoke coming from your wheels after your stop, call your mechanic and a tow truck asap because you could be experiencing serious brake problems. As you can see, brake parts wear out over time and delaying maintenance could put you, your passengers and everyone else on the road at an unnecessary risk. Avoid a more expensive auto repair bill by taking your car for service when you first start experiencing any of these signs. 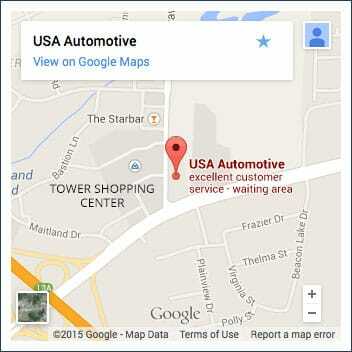 At USA Automotive, our team of highly qualified technicians will be happy to check and fix the problem for you.